In the next episode of Ghost Hunters International, explore a dormitory which has been occupied by the homeless who have more or less been forced to live. They head to the women’s area where there have been claims that a footless apparition has been seen. They ask for the apparition to communicate in any way it can and suddenly they hear two distinct knocks, then from the camera view in another room, the rest of the team says they can see something moving on the wall. Tune in on Wednesday to see if the apparition makes the knocks even louder and encounters the ladies of the team. Ghost Hunters/GHI often declare one location haunted and another not so much despite evidence of paranormal activity. What criteria do you think a place needs to be called haunted? Christopher Columbus first spotted Chacachacare Island on his third New World voyage on August 12, 1498 and dubbed it El Caracol because of its shape. Since then, it has served as a cotton plantation, a whaling station and, as it is most known for, a leper colony. It is now named for the native cotton that grows on the island. The Spaniards grew cotton on the island and established a whaling station. By 1791, the island had a sizable population living there. Then it was given to an Irishman, Gerald Fitzpatrick Carry, for services rendered to the King with the proviso it would be returned if needed by the King. He used it for agriculture and grew sugar apples and cotton. In 1813, Venezuelan patriot Santiago Mariño, who later joined forces with Simón Bolivar, used Chacachacare as a base to launch an invasion of Venezuela during its war of independence with only 45 "Patriots". In the next episode of Ghost Hunters International, Barry and Kris are doing a thermal scan while asking any spirits to kindly show themselves. Barry stops Kris to let her know that he thinks he just heard another entity say her name. Tune in Wednesday 9/8 CST on Syfy to see if a spirit is coming out to see the hunters. In the next episode of Legend Quest, the team ventures into a cave to find the lost Cintamani Stone where the water is near freezing. They follow the stream to a small black hole. What’s in it? You’ll have to tune in Wednesday 10/9 CST to find out. Will it be a dead end? Maybe a carving near the mouth of the cave will lead them to their treasured artifact. Do you think it is possible for an animal to be psychic? In this sneak peek, we learn why Nathan asks Duke to help the two Audreys with their search for TJ. Will they find him in time? Why are they so determined to track him down? Catch the new season premiere this Friday, July 15th at 10/9 C on Syfy to follow them on their hunt for the troubled TJ and see if they can stop these plagues. I rather enjoyed the first season. Interested in what Season 2 will bring. "Rising from the Grave - Trinidad"
In the season premiere of Ghost Hunters International, the team is investigating a cave and as they go further and further they continue to hear noises with a deep bass tone. They encourage the noise to come out and meet them as they take pictures of the cave hoping to catch a little more than just the rock formations. As they’re exiting the cave, Kris feels something grab her leg. You’ll have to watch the clip and tune in Wednesday to see if the team really didn’t come out of the cave empty handed. "Ark of the Covenant/Mayan Talking Cross"
Also, in the Legend Quest series premiere, Ashley Cowie leads his team under water in search of an ancient cross. It would be a great find for the team as it’s the most spiritual legend in the Mayan culture. Watch the clip and tune in Wednesday at 10/9c on Syfy to see if they can brave the elements and find it together. Do you think paranormal investigators should do more daytime investigations? Why or why not? Chicago, Illinois – July 2011 - - Rising fiction author, Deno Sandz has announced the release of his new book, Blood Plantation at Amazon.com now. His latest novel takes readers back into the history of slavery with a supernatural/thriller story that’s well written, shocking, heart wrenching, plot driven, spellbinding, and frightening. One of the most famous of all lizard man cases is the humanoid cryptid believed to inhabit areas of swampland in and around Lee County, South Carolina. He is described as being about seven feet tall, bipedal, and stout, with green scaly skin and glowing orange or red eyes. It is said he has three toes on each foot and three fingers on each hand which end in a circular pad on them that stick to walls. Sometimes described as having lizard or human-like features. Celebrity Ghost Hunt is set to premiere on Saturday, July 9th at 10 pm CST. Be sure to watch Chip Coffey investigate the homes of Eric Roberts & Chris Atkins on the Biography Channel. I don't have BIO. So, you all will have to let me know if it's any good or not. The town where anything is possible returns with all-new adventures. In our sneak peak “Liftoff”, Fargo is busy working on a spaceship when Zane hops on board to grill him about Lupo, closing the hatch behind him. Unfortunately for both of them the ignition switches were on and with the hatch closed the ship’s engines ignite and launches both of them into outer space! Catch the extended clip to see how things went terribly wrong and tune in to the premiere this Monday to see if Sheriff Carter can get them safely back to Earth. On the season finale of Haunted Collector, lead investigator John Zaffis and his team are detecting outrageous readings on their EMF reader near a wall of swords. They suspect it could be because there’s something electrical in the wall behind the sword but that doesn’t seem to be the case which makes the sword even more suspicious. Tune in tomorrow at 8 pm CST to see just how haunted the sword may be. Ever wonder if there really is a soul? Do you believe that people can talk with the dead? If spirits of the dead exist, where do they reside? Can we receive visitors from Parallel Universes? 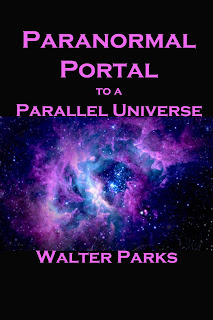 A Paranormal encounter led to this eBook by Walter Parks available in all formats, including PDF that addresses these questions. "My friend Dr. Robert (Bob) Russell said that he knew a girl that could communicate with the dead. I didn’t believe him. He invited me to an “encounter” to prove it. We went to a very weird old house where a Paranormal Investigative Team was working. They had some pretty sophisticated equipment. We all watched as their equipment recorded the paranormal encounter in detail. The temperature sensing equipment showed significant and rapid temperature drops when the "entities" appeared. Their electromagnetic sensors recorded the spikes of appearance and higher than normal levels as their presence continued.